Once we went to a really fancy italian restaurant, and my sons both tried the lobster bisque. They had heard some comedian talking about it, so they had to try it. Well, of course, they loved it. I tasted it, too, and I was really impressed. Naturally, when I’m impressed, I want to try to make it. So, I did some research and found some good recipes. Unfortunately, lobster if quite expensive. I decided to do it with shrimp, which, of course, isn’t cheap, either, but at least it’s not as pricey as lobster. It has a lot of steps, but it’s very flavorful, because of the shrimp stock you make! There are a few ways you could approach this bisque. One way is to use uncooked, unshelled shrimp. Another is to use shrimp that are uncooked, deveined (but still in the shell). A third is to use whole shrimp, complete with the heads. The more stuff that comes with the shrimp, the more flavor you’ll have in your stock. It’s more work, but I’d recommend the whole shrimp. It doesn’t really make a lot of difference how big the shrimp is, either. For this instance, I used uncooked, unshelled shrimp (no heads) that are about the size you normally see in shrimp platters. I started out with one of my 12" shallow Dutch ovens, covered, with the water. Once the water was boiling, I tossed in the shrimp and watched them turn that sweet pink\orange shade and curl. If you cook the shrimp too long, they get all rubbery. Once they were done, I pulled them out of the water, but left the Dutch oven on the coals. Then, I doused them in cold water while I peeled the shells, tails, and deveined them. I threw away the veins, of course, but the shells and tails (and heads if you’ve got them) all went back into the stock to boil some more. I set aside the shrimp meat, reserving it for later. Once all the shrimp shells and parts were happily boiling away, I added the tomato paste. I put the lid on and let that boil for a long time. How long? Well, that kinda depends on how much time you have. The longer it boils, the more flavorful the stock. I let it go for about an hour. 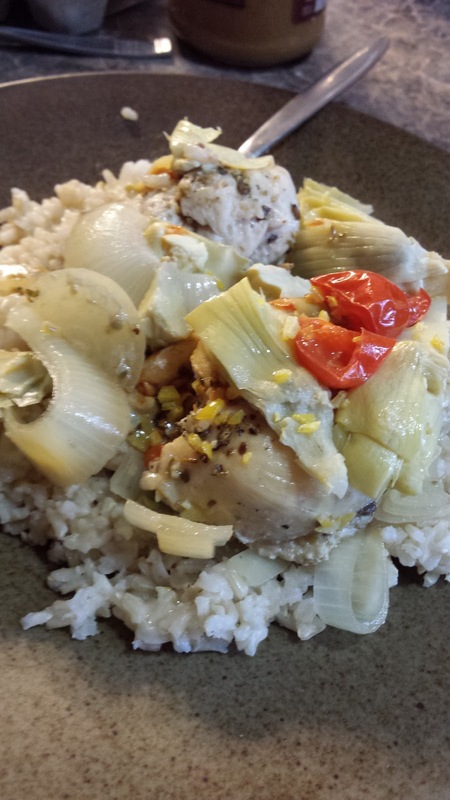 As that time was nearing an end, I got a second dutch oven on some coals, with just a bit of oil in the bottom, and I started dicing up the veggies in the second set of ingredients. I tossed those in the second Dutch oven and cooked them until they were quite soft. Then, I took them off the coals and mashed them with the back of a slotted spoon. It will be a coarse mash, and that’s OK.
Then, I strained out all of the garbage out of the stock, and added the smooshed veggies. Then I added in all of the seasonings in the third set of ingredients. Finally, I added in the cream and let it heat and simmer for about another half hour. As it was simmering, I made a slurry of the cornstarch and water, enough to make it very loose and runny (no clumps). I added that in, about a tablespoon at a time, to thicken the bisque. A hint: give some time in between each dose of starch for it to effect the soup, otherwise, you’ll add too much. Last sunday, as I was contemplating what to cook, I got really tempted by a beef roast we had in the freezer. I wondered how to do it, and my wife suggested that I do the traditional onion soup mix braise. That got me thinking! I looked up the ingredients of the mix, and thought of my own ideas and came up with what would be my roast rub! 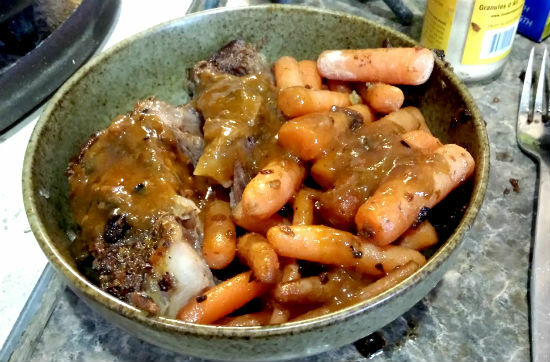 It turned out, sadly, that I was way low on veggies, so I ended up only adding in carrots, but it was still delicious and tender! The first thing to remember is to start with a fully thawed roast. A couple of days in the fridge, or a few hours under cool water will do the trick. Once it was thawed, I put it on a plate, and sprinkled, grated, and/or tossed the rub ingredients onto it. I was pretty liberal with the garlic powder, the dried onions and peppers, and cautious with the chili powder (it’s homemade, and it’s got a big, bad kick). I drizzled on the olive oil, and rubbed it into the surface of the meat. Then, I flipped it over and did the same to the other side. I let that sit, covered with plastic, on the counter while I got the coals and the Dutch oven ready. That allowed the seasonings to absorb more fully into the meat, especially the salt (which also tenderizes). While that was getting more and more flavorful, I got some coals lit, and then put a lot of coals under my 12” with a bit of olive oil in the bottom. I let that sit and heat up. A lot. Finally, I could tell that it was really hot, and I put the meat on the bottom of the open Dutch oven. Immediately, it started sizzling, showing me that my waiting was worth it! After a few minutes, I turned it over and I could see the sear on the meat and the blackening of the spice rub. The smell was wonderful! 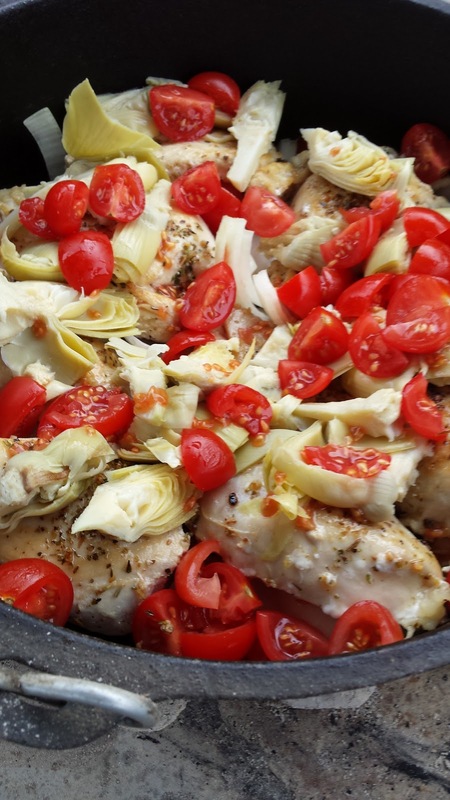 By the way, searing the meat does not “seal in the juices”. It triggers what’s called “The Maillard Reaction”, browning the surface of the meat and giving it that sweet-ish tangy tones that we love so much! Once the second side was seared, I re-arranged the coals for roasting (I also replenished a bit, since they were starting to diminish). Every 20-25 minutes or so, I would take coals from my chimney and replenish them under my Dutch oven and on the lid. Then, I’d add more fresh ones to the chimney to start. I think, in the end, I cooked it about 2 1/2 to 3 hours. When I was about an hour away from serving, I started getting the veggies ready. In this case, that just involved checking the fridge to see what was available, and opening up a bag of baby carrots into the Dutch oven. 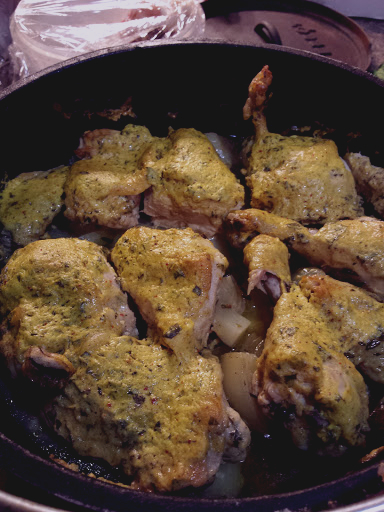 If I’d had potatoes, onions, or anything else, I would have cut them up and added them to the Dutch oven, around the meat. Finally, it was done. I brought it in and removed the meat and veggies to a serving plate. Then, I took the gravy ingredients and the Dutch oven back out to the coals. First, I dribbled in some lemon juice (maybe 2 Tbsp, maybe more), and used that acid with the heat to scrape up all of that yummy brown fond that the meat had left on the bottom. Then, I whisked together the water and the flour (so there are no clumps), and slowly whisked that into the liquid in the Dutch oven. It heated and boiled, and became a wonderful gravy. The meat was tender and flavorful, the veggies were perfect, and the gravy livened them all up and tied them all together. It was a delicious meal. But then, I thought about the recipe that I’d heard of using mashed dark beans in brownies to lessen the oil content. My wife had made them a long time ago, and they were delicious. The “beaniness” didn’t come through, and it had a very smooth feeling on my palate. So, why not in a pie? I mean, really, it’s the same idea for a pumpkin pie. You make a custard with eggs and sugar and use pumpkin puree for the texture. You just use different spices, right? So, I decided to give it a try. But, as I was making it, I was careful not to tell my family what I was doing. If it flopped, I wanted to preserve plausible deniability! I tackled this pie in three steps: First, the beans, second, the crust, and finally, the rest of the filling. There are a few ways you could approach the beans. One is to just bust open a couple of cans of refried beans (neutral ones, without any additional flavorings, like garlic, etc...). Another approach would be to open up a couple of cans of beans. If you do this, I would recommend using a couple of different kinds, just to make for a more complete protein. The third approach is what I did, because, of course, I like more work. Duh. I mixed a half bag of dried black beans and a half bag of dried kidney beans into a bowl with a lot of water and let them soak overnight. Then, using the same 10” Dutch oven, and about 15 coals underneath, I simmered the beans until they were very soft (that took about a couple of hours). In any case, once you’ve got some soft beans, you have to mash them. I tried this interesting device that looks like a saucepan with a smashing wedge on the inside attached to a crank. It didn’t work. Maybe the holes on the bottom were too small, but it just didn’t do it. So, I pulled all the beans back out, and used a potato masher. If you do this, use one with a flat surface and holes instead of one with wavy heavy wire. It will mash better. You could use a slotted spoon, too. Or, of course, you could use a blender. But, who wants to do that? That’s too easy! Then, I made the pie crust in the 10” Dutch oven according to the instructions on that other page, listed above. I didn’t parbake it this time, but next time I probably will. So, at this point, I had the pie crust ready, the beans smooshed and ready, and some coals were lit and heating up. It was time to make pie! I started by smooshing the sugar, the molasses, and the butter together, creaming them up. If you want to, you can just use brown sugar, but I like adding my own molasses, because I can make it darker and richer if I want to. I creamed them all together until it started to get a bit fluffy, as tiny air bubbles started to incorporate into the mixture. I added the eggs and blended that in as well as the other flavorings. Finally, I folded in the beans. Once they were folded in, I stirred it all pretty aggressively to make sure that it was all incorporated. I poured the mix into the waiting pie crust in the 10” Dutch oven, and set it on the coals. I baked it, covered, for about 45 minutes or so. I’ve found that I don’t trust the toothpick method when testing the doneness of pies. It works OK for cakes, but there have been times when the toothpick has come up clean and it’s still runny in the middle. I look for jiggle and touch for resistance instead of toothpicking. 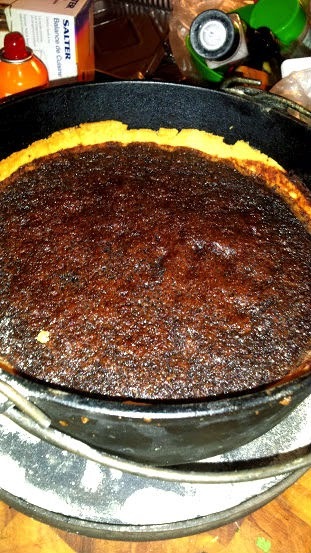 Make sure, also, that you turn the Dutch oven and rotate the lid every 15 minutes or so of baking, so you don’t have hot spots burning parts of your pie. Also, with a long cook time like that, you’ll want to have a side fire going so you can replenish your coals as needed. When it was all done, I took it off the coals, and let it cool with the lid off. I like to serve it right out of the Dutch, but if you’re going to lift it, make sure that it has cooled, so the crust is fully set. I was really pleasantly surprised with the flavor of the pie. My wife said she was amazed, and my kids liked it, too. Who knew beans could be dessert? 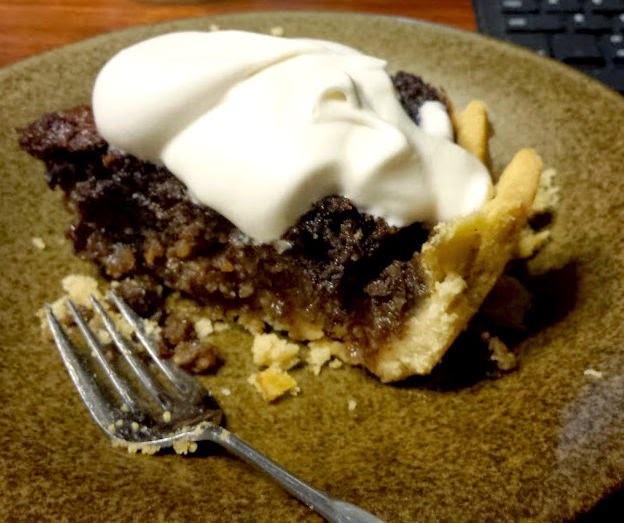 I’ve always loved pecan pie, but I’ve never made it, and I had no idea how. But then, I figured, I’d just do what I always do, that being to look up some recipes and blend the coolest ideas into one. I also talked with my dear sister, who gave me some really good ideas as well. Her biggest idea was to add the dates. She said that it gives some substance to the custard, even though they essentially dissolve in the cooking process. She also suggested I try the dark syrup, rather than the light. Both ideas were spot on, and turned into the best pecan pie I think I have ever eaten. 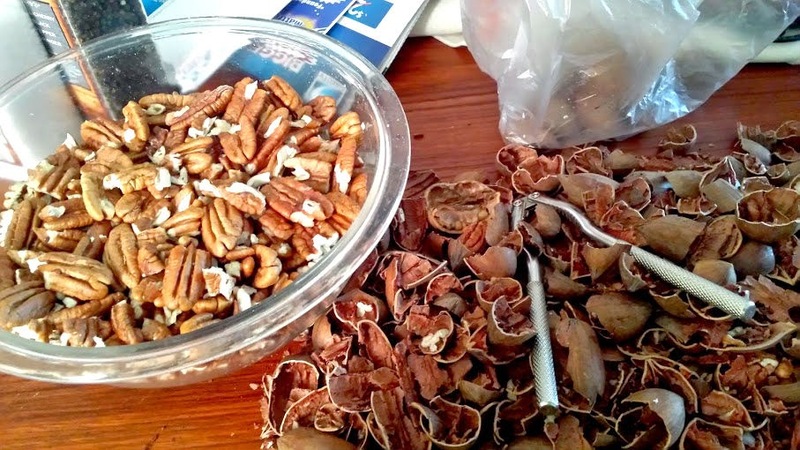 I also learned from one big mistake: Don’t buy pecans in the shell. I like to cook from scratch as much as possible, and sometimes that leads me to do some pretty stupid things. 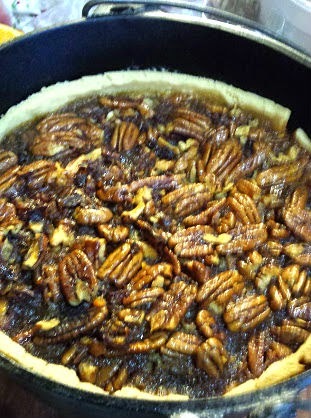 Like staying up past 12:30 am shelling enough pecans to make a pie the night before. Not only was I exhausted, but my fingers were cramped. Don’t be like me. Buy them shelled. Your hands will thank you. For the process of making the pie crust, I’ll refer you to the previous post, at http://www.marksblackpot.com/2014/12/how-to-make-dutch-oven-pie-crust.html , to follow. I would strongly recommend doing the parbaking. I did it this time, and it made a big difference, because the crust didn’t soak up so much of the liquid of the filling. It was much more flaky. Then, I melted the butter over the coals left after the parbaking of the crust. I added the brown sugar and I whisked it all together until it was melted and smooth. Then, I took that off the heat and added in the corn syrup, stirring as I went. I then added in the rest of the ingredients, except the eggs, the dates, and the pecan halves. The filling mixture was still quite hot at this point, so I was nervous about dumping the eggs right in and having them curdle or scramble right away. So, I decided to temper them. I broke them into a separate bowl and whisked them to break them up and blend them smooth. Then, while whisking with one hand, I added tablespoonfuls of the mixture to the eggs with the other. The idea is to bring the temperature of the eggs up gradually, so they don’t cook right away. Finally, tablespoon after tablespoon, it felt like they were warm and I poured the whole thing back into the mix. Then, I added the dates and the pecans. Finally, all of that was poured into the crust that was still in the 10” Dutch oven. I put the lid on, and set it on fresh coals, as indicated above, and baked it for about an hour, or until it was clear that the filling was set to the center. I let it cool. completely. This time, I chose to serve it from the Dutch, rather than try to lift it out. The crust, however, was quite durable and probably would have easily survived the lift. The whole pie was incredible, especially with whipped topping! My sister was definitely right about the dates.